The flag is quartered blue and white/ According to Aleksandar Solovjev's Contributions to Bosnian and Illyrian heraldry, at the time of writing of this book (about 1330), Neretva was part of Bosnia (since 1324), whose coat of arms at that time was "Azure a bend argent", that is its oldest known coat of arms, used by Ban Stjepan Kotromanić (died 1353). The flag attributed to Neretva thus might actually be the flag of Bosnia, having been derived from its coat of arms. Narent would be, more or less, modern-days town of Metković, at least the town considers itself the inheritor of the medieval port of Narent that was located a bit further upstream river Neretva (Italian, Narenta). Metković adopted in the 1990s a coat of arms that reflects this ancient design and bears it on its flag. Drijeva, medieval market town on lower Neretva, today the settlement called Gabela. Name was given according to the Old Slavic word for ship (drijevo); in Latin called portum Narenti and forum or mercatum Narenti. Drijeva was developed as a center of trade between the coast and the inland. Different stuff was traded, mostly corn, salt and even slaves from Bosnia. The place was first mentioned in 1186 in a contract between the Serbian ruler Stefan Nemanja and Dubrovnik, which grated freedom of trade in Drijeva to Dubrovnik merchants. In the 13th century Drijeva shared the fate of Zahumlje; around 1280, it was under the rule of George, son of Duke Andrija. In the beginning of the 14th century, it was under Serbian rule; in 1303, Dubrovnik is mentioned as having leased the Drijeva customs facilities. They were paying to the rulers a yearly fee of 6,000 golden coins (1356). From 1326 until 1382, Drijeva was under the rule of the Croato-Hungarian King Louis I of Anjou. In 1404, Drijeva was part of the fief of Duke Hrvoje Vukčić Hrvatinić, in 1410, transferred to Duke Sandalj Hranić, in 1435 to Dke and Herzog Stjepan Vukčić Kosaća, and in 1444, temporarily, in the hands of the Bosnian King Stjepan Tomaš. Duke Sandalj shared the levies from Drijeva with the Radivojević (Vlatković) and Pavlović, but the Herzog Stjepan took it all for himself. In 1448 the Ottoman troops burned down Drijeva; in 1452 the Venetians built a new settlement on the right bank of Neretva. After the Herzog's death in 1466, Drijeva lived through hard days and, at most in 1493, the town was seized by Turks, who set up there their emin to collect customs tax. Gabela (from Italian, gabella, customs; from Arab, al-qabala, tax). The medieval marketplace Drijeva was renamed Gabela in the second half of the 15th century. At least in 1493 the place was conquered by Turks. Before 1558 they built a rectangular fort with towers at angles, named Sedislam (The Wall of Islam). It became the center of the Gabela Captany, organized before 1561. In 1537 Gabela was incorporated to the Nevesinje kadiluk. In the middle of 17th century, Ali-paša Čengić rebuilt and increased the fort, so called Novi grad. In 1693 the Venetians seized Gabela and revamped the fort, which they destroyed in 1715 they destroyed it. In 1718, Gabela was again under the Ottoman rule. Until 1878 it was an important border place between Herzegovina and Dalmatia, but the military role of Gabela was overtaken by the town of Poćitelj. Gabela is today a small town in the Municipality of Capljina, located in Bosnia and Herzegovina about 3 km from the border with Croatia on the right bank of river Neretva; the town is again an important point of transit, with a railway passing by. Based on archeological findings and his analysis of Homer's work, the Mexican philologist Roberto Salinas Price claims that Gabela may be the site of the ancient Troy. In the Catalan Atlas kept at the French Nztionl Library (images), the flag of Neretva is quartered blue and silver; silver is darkened by age so much that is is almost black nowadays. 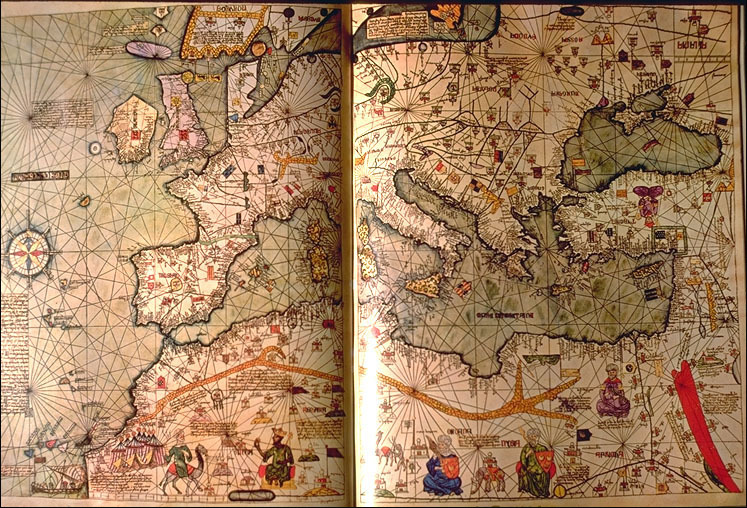 The British Museum, London, possesses a facsimile of the atlas (image), in which the flag of Neretva is painted with gold instead of silver, an error that has appeared there at some other flags as well. The 35th flag mentioned and illustrated in the "Book of All Kingdoms" is attributed [f0fXX] is apparently attributed to the town of "Narent". The author reports he sailed from "Boxina" and then visited the town of "Sara", "Simbichon" and "Narent"*, and then describes the flag of "this land", being unclear if only "Narent" is meant or also the other two towns. The 2005 Spanish illustrated transcription of the "Book" [f0f05] shows a flag quartered white over purple; the flag is shown in the ogival default shape of this source. The anonymous author of the "Book" describes the flag thusly: And the king of this land has for sign a quartered pendon, the two quarters purple and the two white like these". *Sara would be modern town of Zadar (Italian, Zara), the pre-Roman Jadera. Simbichon would be the modern town of Šibenik. E el rey d'esta tierra a' por señales un pendon a cuarterones, los dos cuartos cárdenos, e los dos blancos atales. 1. cárdeno actually means "iris" and these flowers are often purple, but the color shade often inclines towards blue so much that this might be considered the true color. If these variants are counted together with the truly blue ones, then blue might be considered the most widespread color of irises. 2. A number of Spanish dictionaries which I have consulted during last years do give "purple" as the meaning of cárdeno, but also "color of water" as the other meaning, and blue is the color which is usually associated with the water, although its proper heraldic color is actually white, or a combination of white and blue stripes (usually wavy) is used. Although the dictionaries gave no information about when when this other meaning of the word did appear, the word itself was designated as archaic, so it is not impossible that this has happened by the time when the "Book" was written or when the earliest portolanos were made. 3. Some flags from the "Book", most notably that of Naples, do erroneously use purple instead of blue. 4. If the illustrations in the 2005 edition of the "Book" do reproduce those from the original copy well, then it means that the original purple color was changed by age into a blueish shade of gray - something that might indeed resemble the "color of water". This change might have actually happened rather early if a pigment was used which was not very stable in chemical terms, so it might be possible that makers of the earliest portolanos did use the book copies in which purple color could not have been easily recognized as such. This, in combination with some or all of the above facts, might have lead to the replacing of an irrecognizable color with the first one to suggest itself - that is, blue. In all three manuscripts of Libro del conoscimiento de los reinos which are kept in the libraries in Madrid [fofXX] (Hakluyt Society edition, 1912), the flag of Neretva is described as quartered purple and white, but is depicted as such only in Manuscript "N". In Manuscript "R", the same text is accompanied with the image of a shield of arms, blazoned as "Azure a cross patonce cantonned with four crosslets all argent". In Manuscript "S", the blazon is "Sable a cross formy fitchy argent between four crosslets or". The flag held by the demi-lion in the crest was the basis of the design of the flag of Bileća, Bosnia and Herzegovina. On the map of Guillelmus Soleri, which was created on Majorca c. 1385, and nowadays is kept in the French National Library, Paris (shown in D. Wigak's Historic maritime maps used for historic exploration 1290-1699, Parkstone Press, New York), the flag of Neretva is very similar to that from the map of Angelino Dulcert, but with a more oblong form.